148/365(+1), a photo by Luca Rossini on Flickr. Since we had to shoot two weddings between Friday and Saturday, my parents took Agata to their summer house at Argentario, on the seaside of Tuscany. Today they called us saying that everything is so beautiful there and that Agata is having such a good time that they won’t be back before Monday. This means that today we are free, no weddings, no work, no baby. Lucky me, since after two weddings in a row I always feel exhausted. So, I invested my day into that activity which I miss most since Agata is born: movies-watching. I have always been a huge fanatic of movies, I was one of those freaks recording tons of late-night movies on VHS, just because in Italy good (and weird) movies are always broadcasted when it is virtually impossible that anyone is watching. By the age of twenty I had a huge movie library on tapes. Then it was the time of DivX, DVDs, mpk, and so on. Now, thanks to (legal) movies-streaming services I don’t have to bother anymore, I just switch my appleTV on and I enjoy the thousands of great movies in the database. So, today I started with Leap Year (Ano Bissexto, not bad), then I watched Hellraiser, I chilled out with a couple of episodes of South Park, then it was the time of the (boring) “The Rum Diary”, and finally I went to bed, but only after an episode of Spaced and the pilot of Traffic Light. The other thing I can do freely and fearless since Agata is with her grandparents, is drinking. 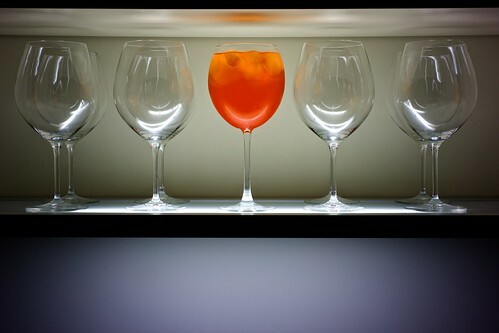 So I poured myself this huge glass of Aperol Spritz (ice, 1/3 Aperol, 2/3 Gewurztraminer, a bit of tonic water) and I took a photo of it, into our new kitchen cupboard. I love the embedded light! The spritz got me unexpectedly (!) stoned, I could barely order some (excellent) pizza, and keep going with my personal movie-marathon. Shawn of the Dead and Hot Fuzz, great movies! I did mix the Campini with prosecco but it was just not happening for me, I'm told Aperol is much nicer … Aperol spritz was exactly what I wanted to have when I settled for Campini instead, I figured to myself “how different can it be?” well that was an error. First round of Aperol Spritz on me then when I get back to the eternal city!